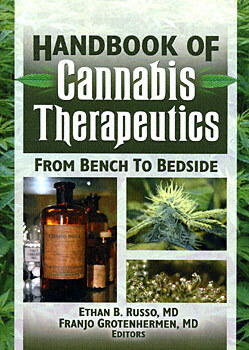 The Handbook of Cannabis Therapeutics: From Bench to Bedside sets aside the condemnation and hysteria of society's view of cannabis to concentrate on the medically sound aspects of cannabis therapeutics. The world's foremost experts provide a reasoned, thoroughly researched overview of the controversial subject of cannabis, from its history as a medicine through its latest therapeutic uses. The ltest studies on the botany, history, biochemistry, pharmacology, toxicology, and clinical uses for various illnesses such as AIDS, epilepsy, and multiple sclerosis, as well as side effects of marijuana are all examined and discussed in depth. The book is carefully referenced to encourage examination of previous studies and provides tables and figures to enhance understanding of the material. "Authoritative....These contributions have been chosen to cover a wide range of possible therapeutic uses of cannabis from several perspectives: historical, pharmacological, and medical, as well as presenting a brief foray into the world of endogenous cannabinoids. Enhancing the usefulness of this book is the brief update that the editor provides following each chapter, greatly improving the timeliness of the information." "This handbook diligently gathers the writings of many of the world's foremost authorities on cannabis and cannabinoid therapeutics, offering a comprehensive and unique look into the plant's history, pharmacokinetics, and potential clinical applications. It lifts away the smoky haze of political and ideological rhetoric from the cannabis debate, and provides an objective, scientific, and long-overdue review of marijuana's extraordinary history, pharmacology, and merit as a therapeutic agent." "Required reading for all health care professionals in clinical practice who believe in evidence-based practice rather than politically based practice."